Four people, including a juvenile who is not pictured, arrested Thursday are accused of beating a man for voting for Donald Trump. 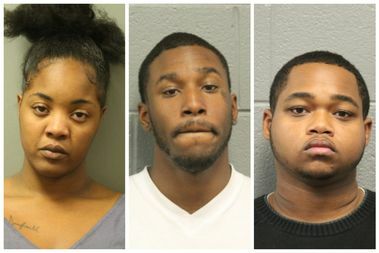 CHICAGO — Four people have been arrested in connection with the brutal beating of a 50-year-old man they accused of voting for Donald Trump in North Lawndale last week, police said. The attack, captured on video, happened at the intersection of South Kedzie Avenue and West Roosevelt Road in North Lawndale Nov. 9, the day Trump won the presidency. In the 32-second video, two men are seen punching and kicking the 50-year-old man in the street. Onlookers can be heard saying "You voted Trump?" and "Beat his a--." Another witness said, "Don't vote Trump" and "Steal his stuff." In a second 45-second video, one of the attackers is seen jumping into the gold car at the intersection. In an attempt to stop the attacker from driving away, the victim hangs on to the rear driver's side window. As the attacker speeds away from the scene, the victim is dragged by the car, as seen in the video. The 50-year-old victim was transported to Mt. Sinai Hospital, where he was treated and released, police said. On Thursday, police arrested Julian Christian, 26, of suburban Broadview, in connection with the beating, police said. After placing him in custody, detectives received "additional information" that allowed police to identify the other attackers, police said in a statement. Police then arrested: Dejuan Collins, 20, of the 9500 block of South Avalon Avenue, and Rajane Lewis, 21, of the 7800 block of South Euclid Avenue. A 17-year-old girl was also arrested but her name has not been released because she is a juvenile, police said. They are each facing one felony count of vehicular hijacking, police said. Ald. Michael Scott Jr. (24th) called the violent incident "very disturbing." "It is very disturbing to see any act of violence, especially an act of violence [that may have been based] on a man's political preference or views," he said. "This is something I and the people of North Lawndale will not tolerate." Scott said he does not yet know whether the man is a Trump supporter. The man beaten in the video publicly spoke out about the attack and stated that he voted for Trump, but that "I did not have a Trump sign on my car."